After three and a half weeks of rice and noodles I’m happy to be back in my own kitchen. 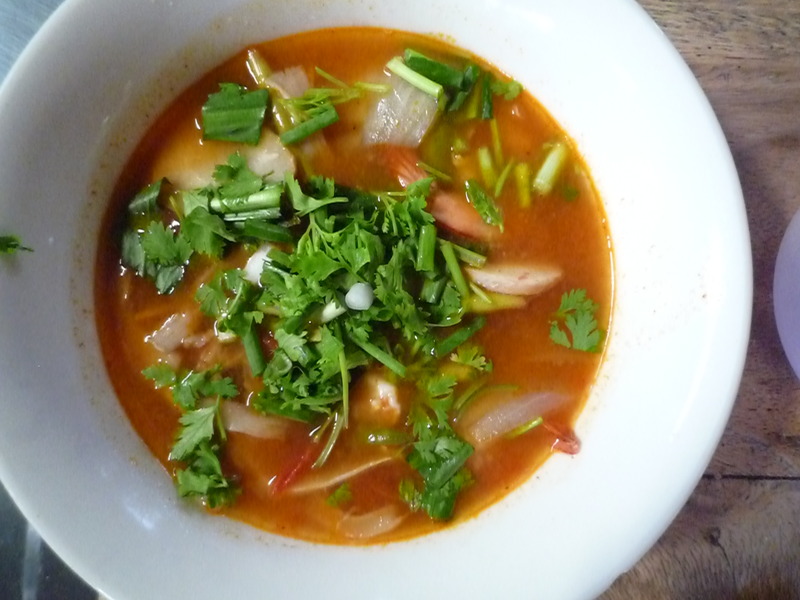 I discovered the Thai kitchen, sometimes even in the mornings, and I started to appreciate spicy food. In times the tears were running down my face and I felt the flames shooting through my throat but it was all for the good, I’m spicy proof now; a chili doesn’t scare me anymore. 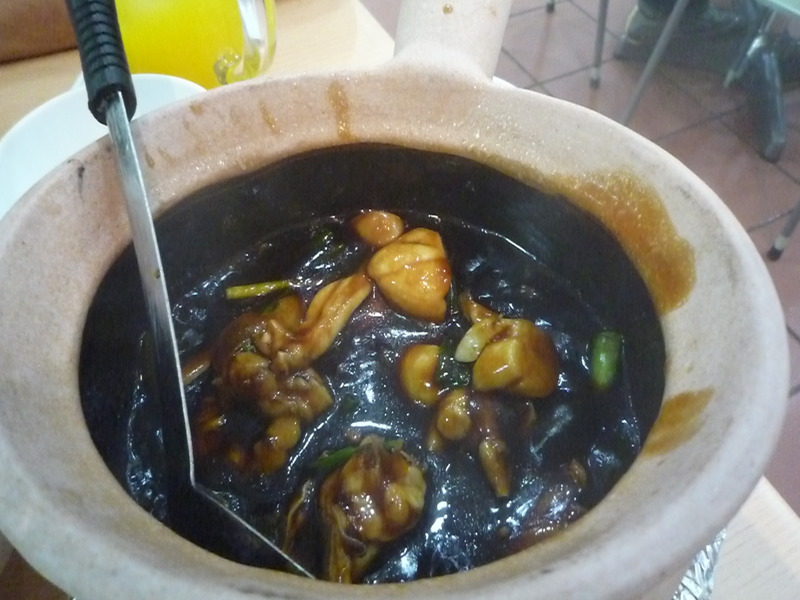 Most of the ingredients were new to me and I couldn’t get myself to taste everything but I felt quite a hero already when ordering frog clay pot, and preserved eggs (eggs marinated in bull urine). After this adventures lunch I thought a safe carrot cake was well deserved. You can imagine the horror when I found some worms/caterpillars in this steamed and carrot flavored mushy cake. At first we tried to avoid eating from the thousands of road eateries that have their restaurant on the back of their motorcycle, no refrigerator or running water. But after a while we became careless, like with the anti mosquito spray, and luckily our sensitive European/Israeli stomachs didn’t complain. We also found out that the cheaper the food, the better it is. When a place starts to be pretentious or cater to westerners it hurts the taste. Three times we craved European food so much that we sat in an overpriced Italian restaurant and twice it was a disaster. 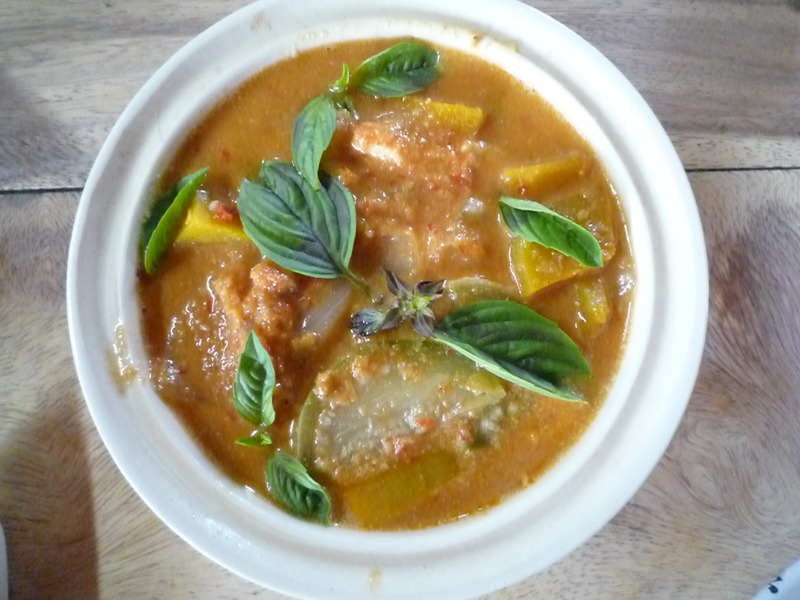 Let Thai cooks cook Thai food not pizza. We had a fabulous cook on the live aboard diving boat in the Similan Islands. She cooked some amazing dishes but when she tried to make us something European on New Year’s Eve, with the best intentions, we were somewhat disappointed and missed her Thai cooking art right away. 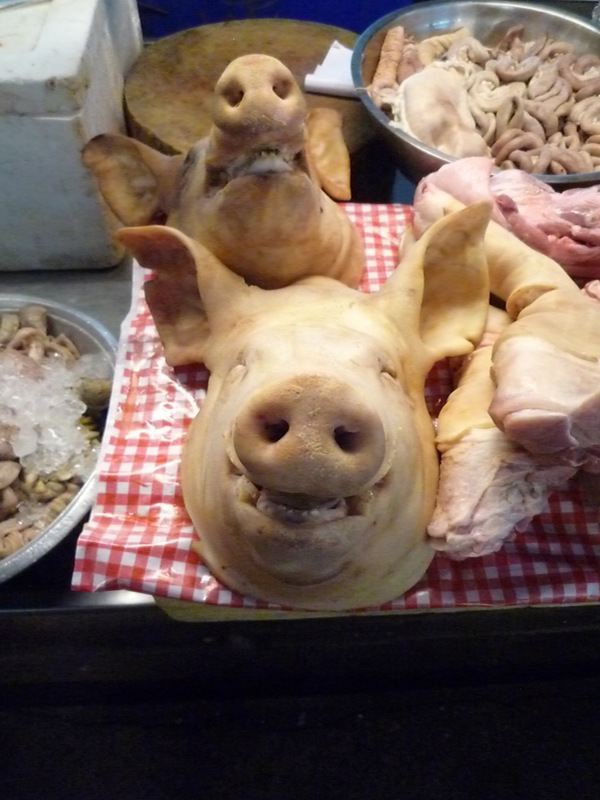 A Thai market is something different. 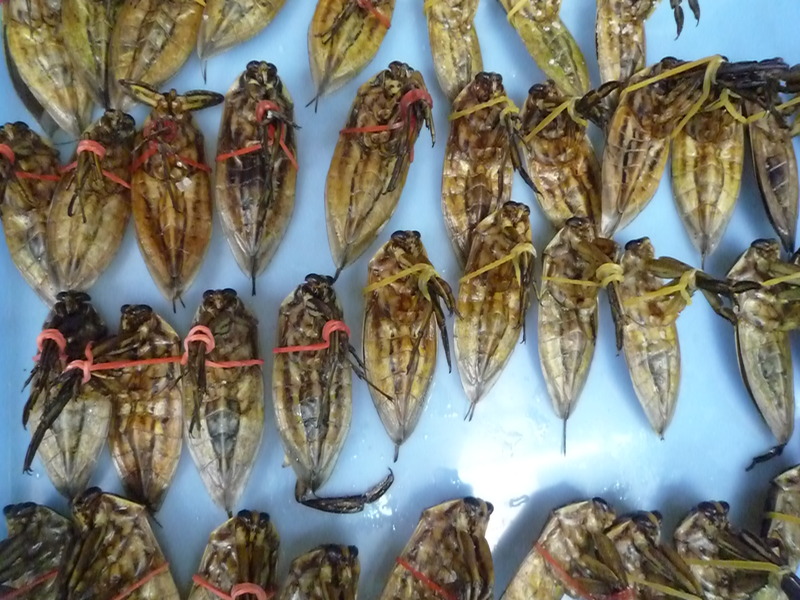 Fresh fish is very important on the coast but also sweet water fish is on the menu. 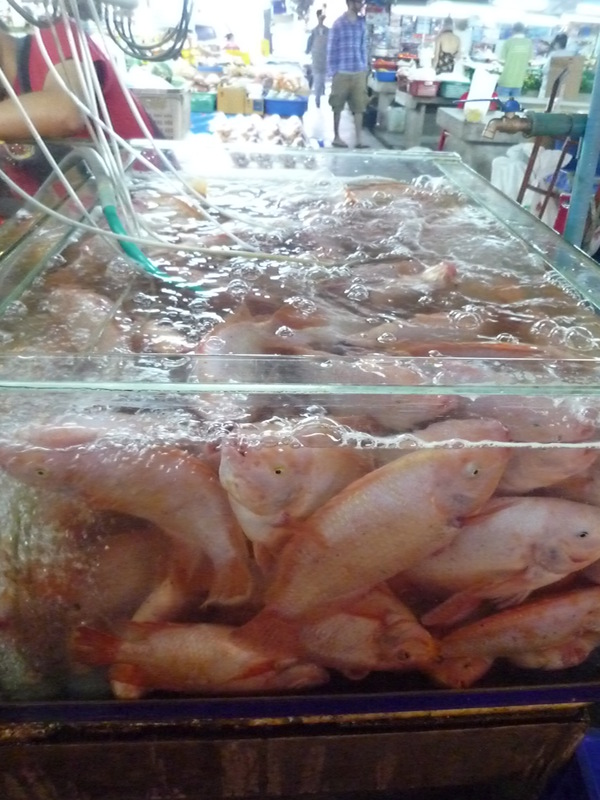 The fish are crammed in small buckets with just enough water to keep them wet. Crabs are tied alive, sitting neatly in a row waiting for a buyer. Even though pork is on every menu, some of the small road restaurants didn’t have anything besides pork, even the candy is layered with fluffy pork on top, still we didn’t see any life pig. Plenty of chicken running around, cow’s next to the road but not one pig? They do appear in pieces on the market so it’s probably just not a popular pet. 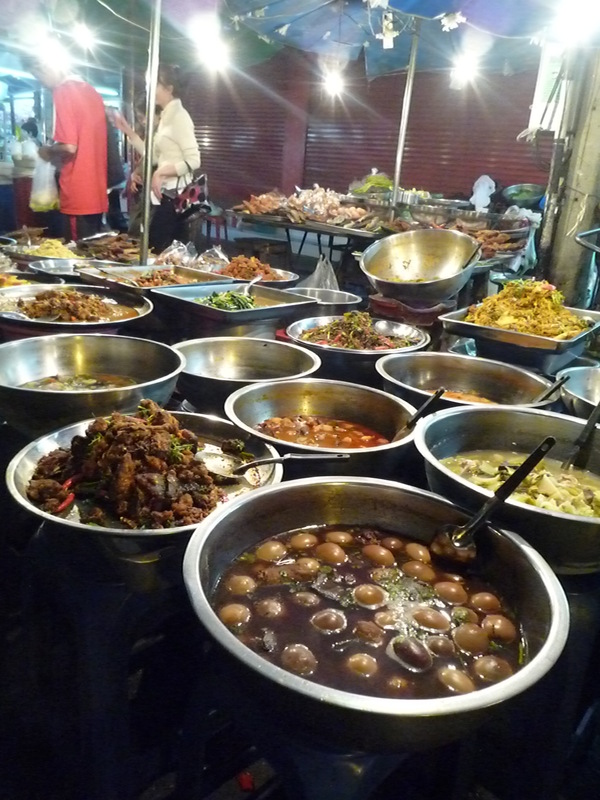 The Thai kitchen doesn’t have any use for an oven; food is prepared in a wok, steamed or fried. 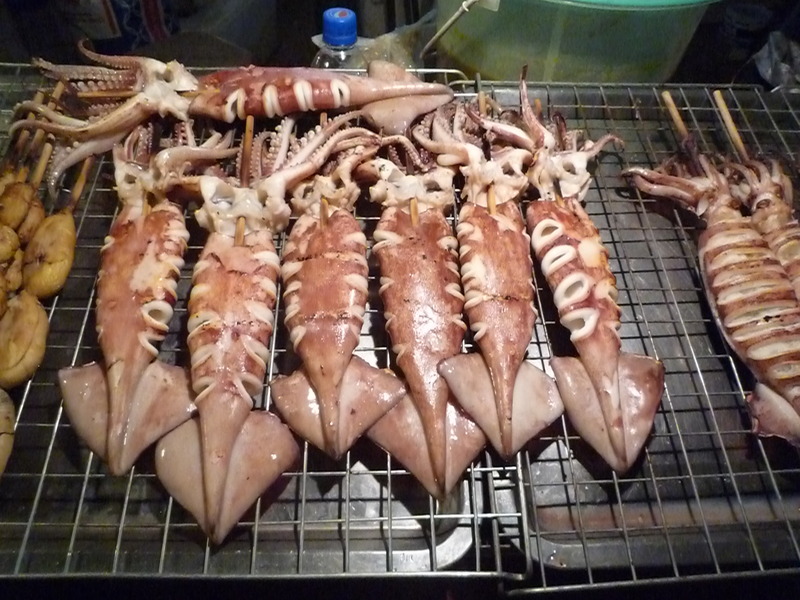 Fish generally comes fried or prepared on the bbq and they don’t believe in preparing it shortly to keep the meat juicy, deep frying is the preferred method. They don’t see the point in vegetarianism either; all dishes come with some type of meat or fish. 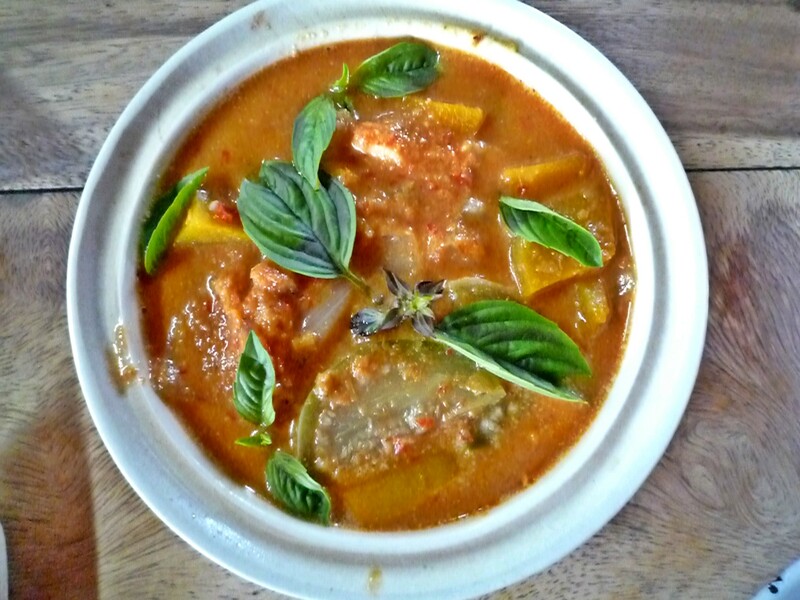 I really don’t mean to be negative about Thai cooking, I ate some beautiful curries and papaya salads. The fruit juices are heavenly and also the simple steamy soups are a delight but there are a couple of things I missed. For one, there was no bread! There is no bread in the Thai kitchen! The same for cheese; I didn’t eat any type of cheese for three and a half weeks. To make the trio complete: wine. The little wine there is, is relatively expensive and there is of course no wine culture. Of course you can find everything when you search well, especially in the touristic places. 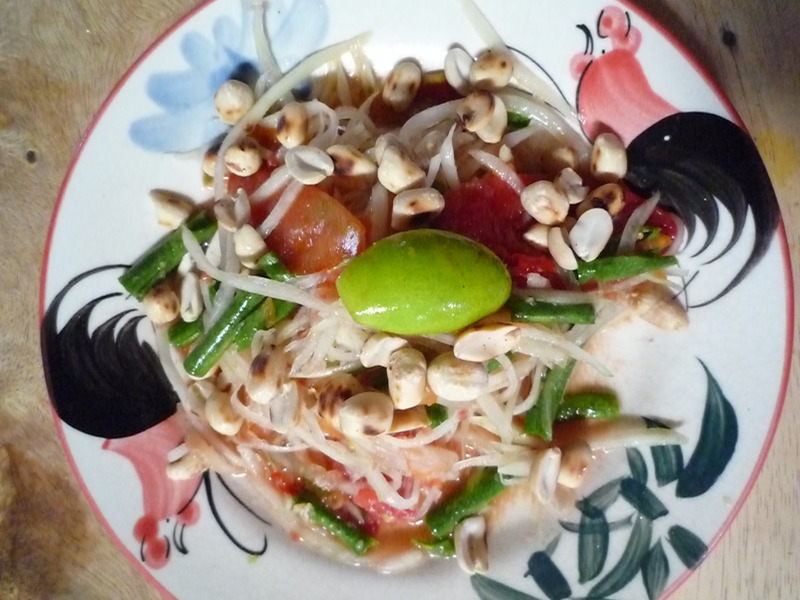 I did find out that the Thai kitchen is relatively easy when you are in possession of the right ingredients. 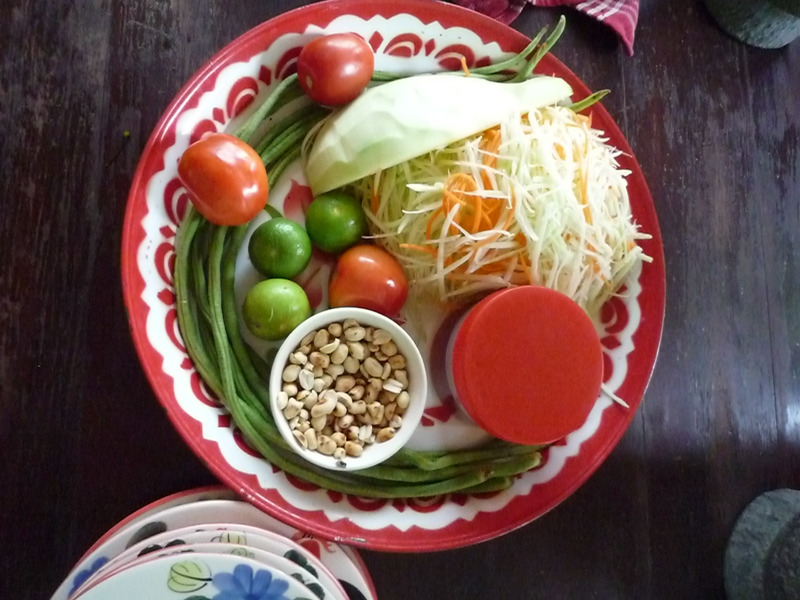 The challenge back home is to find ingredients like pickled radishes, Thai coriander; tiny green eggplant the size of a pea, tamarind/chili paste, keffar lime leafs and so on. So I’m on a mission, I didn’t make any Thai food yet but I better start soon now the memory of it is still fresh. 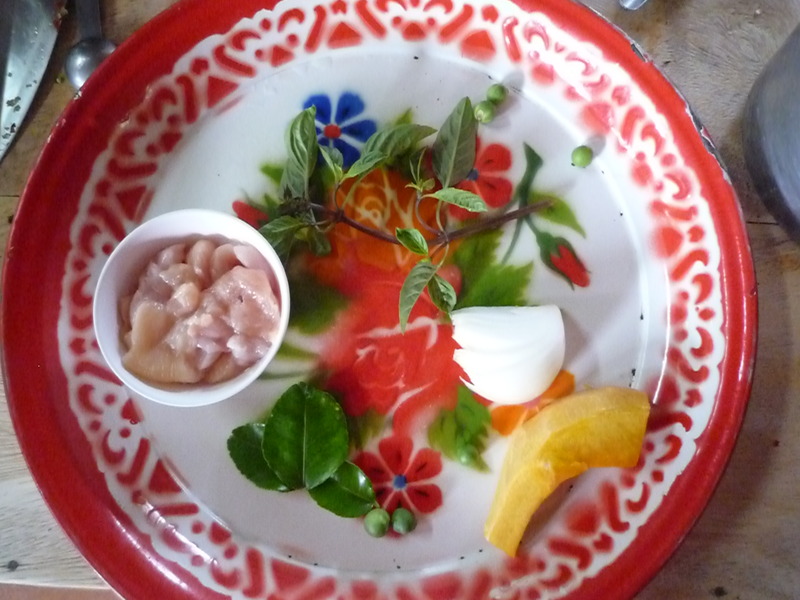 The pictures below are from some of the dishes I made on the Thai cooking Farm. It was a very nice course. 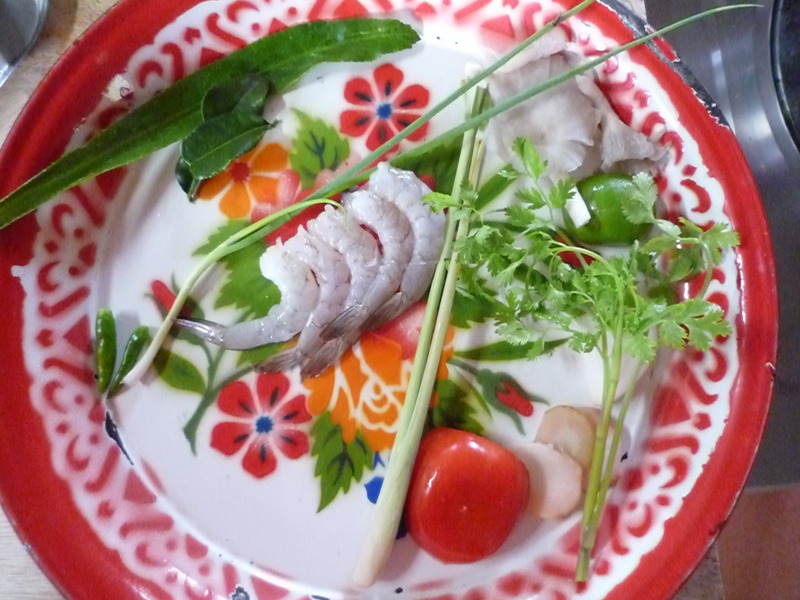 Like most cooking schools around, we went to the local market where they explained about some of the key ingredients. On the farm every person had his or her own cooking station and we made all the dishes ourselves from scratch. Our teacher first gave an explanation about the dish, then he gave away all the tips and tricks while cooking it ones himself. After this little show we had to copy him and eat it all. I had a nice group of people, there were nice conversations at the table and at the end we were brought home by car because we couldn’t walk anymore after 6 courses.